Environmental Photographer of the Year Competition. Global Warming Images is delighted to have one of its images chosen as the winning image, in the climate change category of this prestigious, global, environmental photographic competition for 2010. With over 4000 entries from 79 different countries, the competition is truly global in reach and showcases the worlds best in environmental photography. 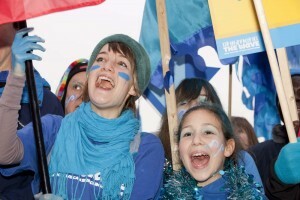 Ashley’s winning image, was taken at the Wave, the UK’s largest ever climate change protest. 50,000 people surrounded the Houses of Parliament to demand the government do more to tackle climate change. The image was taken with a wide angle lens, at the front of the march, right where the action was taking place. The image is hugely powerful, and shows that we all need to stand up and add our voice, to prevent the planet descending into climate chaos. After the floods came the freeze. In Cumbria it feels like we have had an awful lot of weather of late. 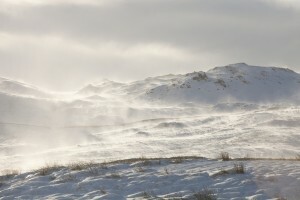 The first snows fell on Saturday 19th December and temperatures plummeted as low as minus 22 degrees celcius in Scotland. 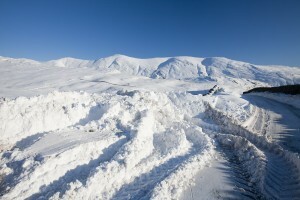 Nearly four weeks later the snow is still lying on the ground and many roads are still blocked with snow. I’m sure folk on the continent will laugh at all our obsessions with the big freeze but in the British Isles you have to go back to the winter of 1962, since we had snows lying at low levels for such a length of time. Here in Ambleside, the mountain rescue team have been rescuing stranded motorists, ferrying the ambulance service personnel around and even taking food to remote outlying houses that have been cut off. For some there has been disruption, for others fun. I’ve been ice climbing on frozen waterfalls that have not frozen over for decades and been on my cross country ski’s up to 2800 feet on Great Dodd on the Helvellyn range. 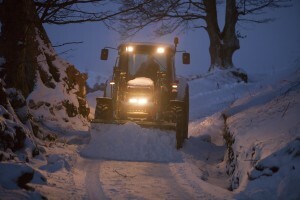 A farmer clearing snow from a track above Ambleside, Cumbria, UK. 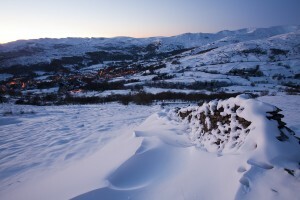 Arctic conditions on Wansfell, Lake District, UK. 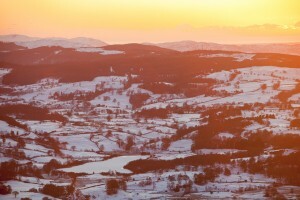 Looking towards Hawkshead from Wansfell at sunset, Lake District, UK. Mike Withers ice climbing on Fisher Place Gill, Thirlmere, Lake District, UK. Mike Withers ice climbing in Fisher Place Gill, Thirlmere, Lake District, UK. Frankie Burgess takes a tumble whilst playing in the snow. 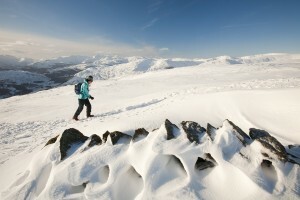 Jill Cooper walking up Red Screes, Lake District, UK. 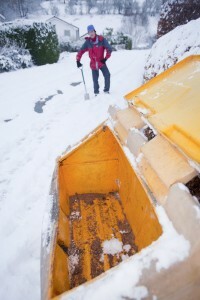 An empty salt gritting bin in Ambleside. Salt supplies were low in many counties as demand became unprecedented. Langdale Ambleside mountain Rescue team members and the North West Air Ambulance evacuate an injured walker who had fallen in the snow, Langdale, UK. 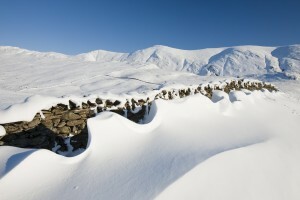 Snow drifts on the side of Kirkstone Pass which has been closed for weeks, Lake District, UK. Snow on the Kirkstone Pass road, Lake District, UK. 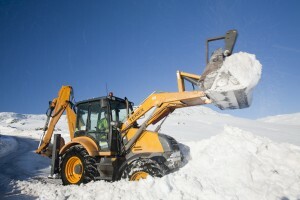 Charlie Middleton clears snow on Kirkstone Pass, Lake District, UK. Ambleside from Wansfell at dusk, Lake District, UK. 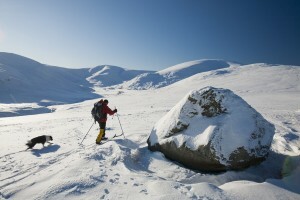 Mike Withers cross country skiing on Great Dodd, Lake District, UK. 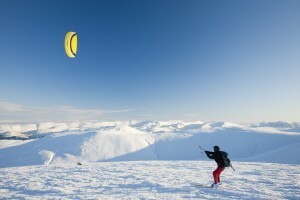 Bruce Corrie upskiing on Great Dodd, Helvellyn Range, UK. Without doubt the Copenhagen conference was a failure. Whilst the people of the world had made it perfectly clear what they wanted, the worlds leaders failed miserably to do their duty, and come up with a fair, legally binding treaty. It would not be fair to brand all leaders as a failure. Gordon Brown’s committed leadership, saved the conference from being even more of a disaster than it was. The American and Chinese leaders however should be hanging their heads in shame. They let narrow political dogma and big business interests get in the way of a deal. History I feel will judge them harshly for this. 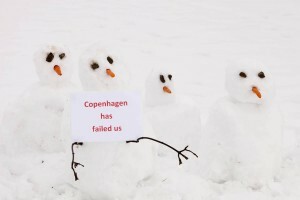 Snowmen show their displeasure at the failure of the Copenhagen summit. 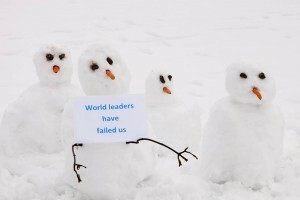 Snowmen protest the failure of world leadersip. 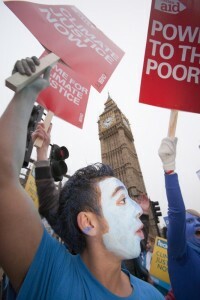 I have just come out of a conference call with Gordon Brown, organized by Avaaz.org. The British Prime Minister answered questions from around the world put to him by members of Avaaz. This clearly demonstrates the power of the international community to co-operate, working over the internet, to let politicians know the strength of feeling amongst members of the public on the issue of climate change. As citizens of planet earth we all have a responsibility to our shared future on this fragile world of ours. One of the delegates asked Gordon, what we could do to help support his leadership, in trying to persuading other world leaders to sign up to a legally binding treaty on carbon emissions, at Copenhagen. His answer was to continue to protest, to make our voices heard and to lobby politicians. One of the ways you can do this it to sign up to the Climate Change Secretary, Ed Milliband’s Pledge. You can add your voice and sign Eds Pledge here. 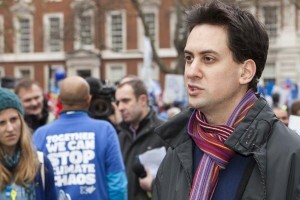 The British Climate Change Secretary of State, Ed Milliband. 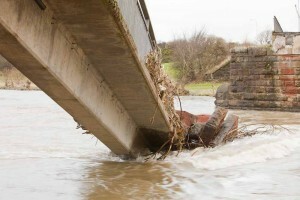 The Devastating floods of November 2009, cut the town of Workington in two, after the bridges across the River Derwent that connect the town were either destroyed or damaged and rendered unusable. This week saw installation of a temporary footbridge by the Third Armoured Engineers Squadron. 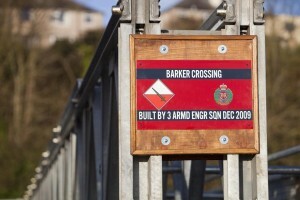 The Bridge named Barker crossing, after PC Bill Barker who lost his life in the floods, now creates a vital lifeline for the town. Cumbria County Council also this week announced that it could take up to two years to put in a new road bridge. This means that the people of Workington still face a 40 mile drive to cross from one side of the town to the other, if they need to use their car. Meanwhile upriver in Cockermouth much work is being done to try and help the householders and shops who were inundated by the floods. 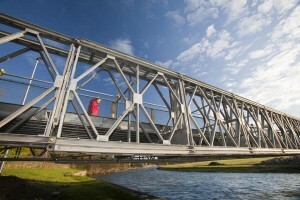 Barker Crossing, connecting the two halves of Workington, spanning the River Derwent. 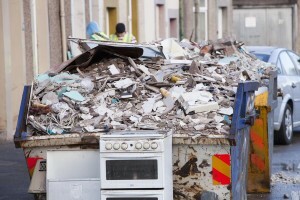 A skip full of rubble outside a flooded house in Workington. This house like many is having to have all the plaster hacked off the walls after they were inundated with polluted flood waters. 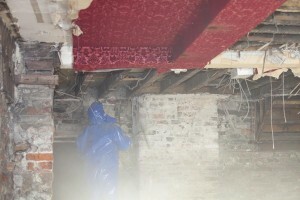 A building contractor ripping out the interior of a shop on Cockermouth's main street, after it was flooded. 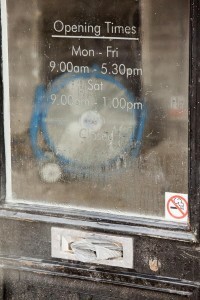 A shop on Cockermouth's main street being dried out after being inundated with flood waters. On Saturday 5th December 2009 the Stop Climate Chaos Coalition organised The Wave. 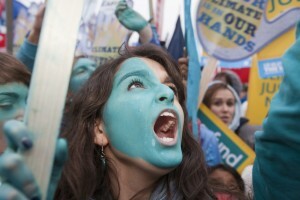 A demonstration against climate change in the lead up to Copenhagen that attracted 40,000 people. The March set off from Grosvenor square, parading through central London and ended up surrounding the Houses of Parliament. 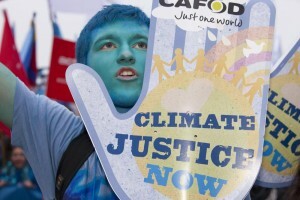 It was the largest ever climate change demonstration in the UK and clearly demonstrated peoples strength of feeling on this most crucial of issues to confront mankind. 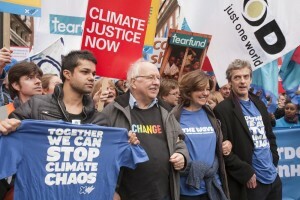 Michael Fish, Greta Scacci and Peter Capaldi show their support for The Wave. 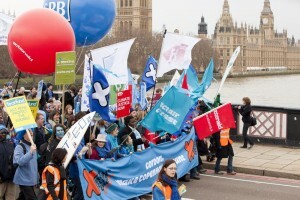 Protestors surround the Houses of Parliament and Big Ben as part of the Wave. A protestor adds her voice to persuade the government to take the Copenhagen talks seriously. 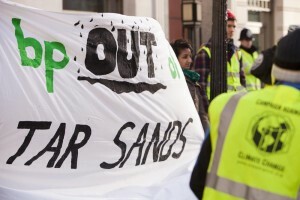 As part of the days proceedings, a cycle protest stopped outside the headquarters of BP to protest about their support for the tar sands. 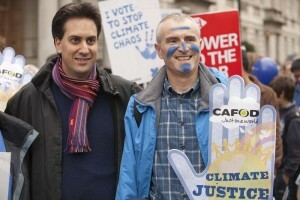 The Energy and Climate Change Secretary of State, Ed Milliband joins the Wave. The Wave surrounds the Houses of Parliament. People of all ages joined The Wave. A protestor at The Wave demands climate justice. On Thursday 19th November 2009, over 31 cm of rain fell in 24 hours on the Cumbrian mountains, the single largest daily rainfall total in the British Isles since records began. 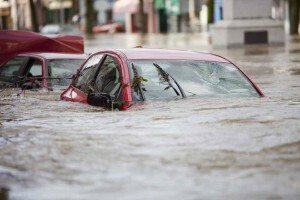 It caused unprecedented flooding, with Cockermouth and Workington being particularly badly hit. 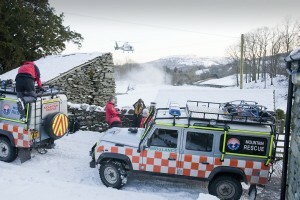 On the Thursday I spent the whole day with Langdale/Ambleside Mountain rescue Team, rescuing stranded motorists. On the Friday I headed to Cockermouth to record the devastation. Dodging the police cordons I got onto the main street, waist deep in floodwater and photographed the RNLI rescuing residents by boat. Saturday was spent in Workington, looking at the demolished bridges. Wading waist deep in the flood waters paid off as my images were used on the front pages of the Independent and Daily Mirror as well as internal shots in the Guardian and two other national papers. A week later the United Nations Environment Program (UNEP) published a map highlighting the increasing frequency and severity of extreme weather events as a result of climate change. 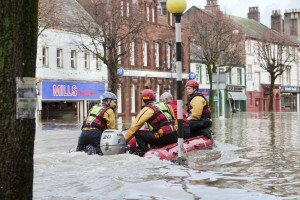 The Cumbrian Floods were one of those events highlighted. 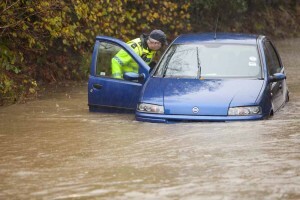 PC Paul Burke inspects a flooded car form ocupants on the outskirts of Ambleside. Rescue workers evacuate residents from Cockermouth's main street. A flooded car on the main street of Cockermouth. A footbridge across the River Derwent at Workington, destroyed by the floods. 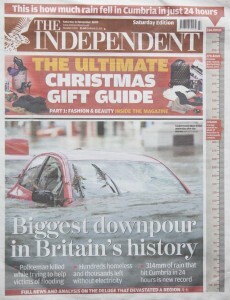 The front page of the Independent. 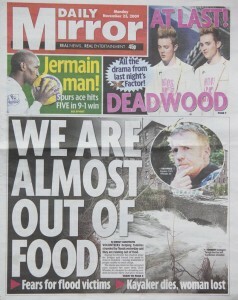 The front page of the Mirror.